My kids tend to get antsy when winter and the cold weather comes. After watching a Curious George episode, we decided to try making our own ice bowling set. We only had 6 water bottles, but a bowling alley uses 10 pins. 1. Fill the bottles/cups with water and set in freezer until frozen. DM Tip: If it is below freezing outside, you could just set the containers outside to freeze. These will be the pins. 2. Fill the balloon with water, tie and freeze. This will be the ball. 3. Use a craft knife to cut a slit down the center of the bottle. Gently remove the frozen pin. 4. Set up the pins and enjoy some wintertime bowling. DM Tip 1: Make extra pins and ball (or have a softball or a bouncy type of ball ready). They can break pretty easy. Another alternative is to leave the pins in the water bottles. 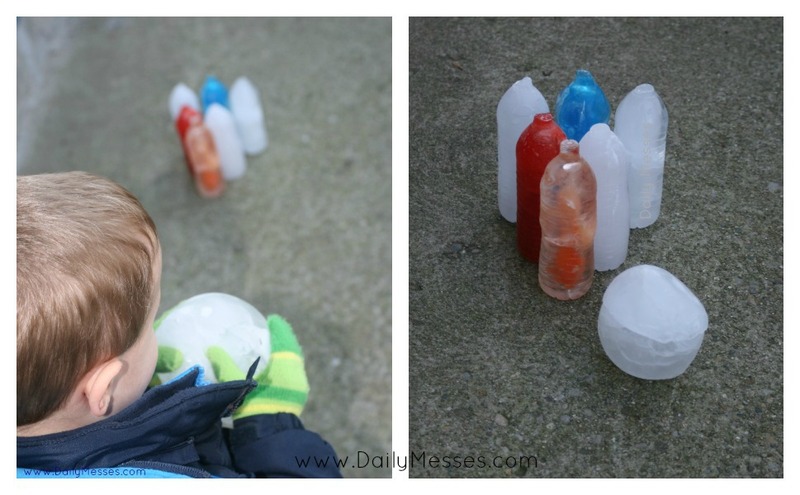 This way if the ice breaks, it is still inside the bottle and you can continue playing. DM Tip 2: If you are playing outside, you can add some food coloring to the water before freezing to make colorful pins. However, wear gloves that you can wash and don't mind if they get stained. DM Tip 3: If you play inside, have towels ready since the pins and ball will melt. Don't use food coloring if playing inside since it could stain. DM Tip: You can mark lane lines with painter's or duct tape.